Pulling into Sarajevo train station as dusk approaches after a tiring 10-hour journey from Zagreb, one could be forgiven for thinking it’s not worth a stopover Miles of sprawling ugly Soviet-style tower blocks so typical of the suburbs of many Eastern European cities do little to encourage the potential visitor. But once you’re in the heart of the city, you find it has a rough charm which really catches the imagination. 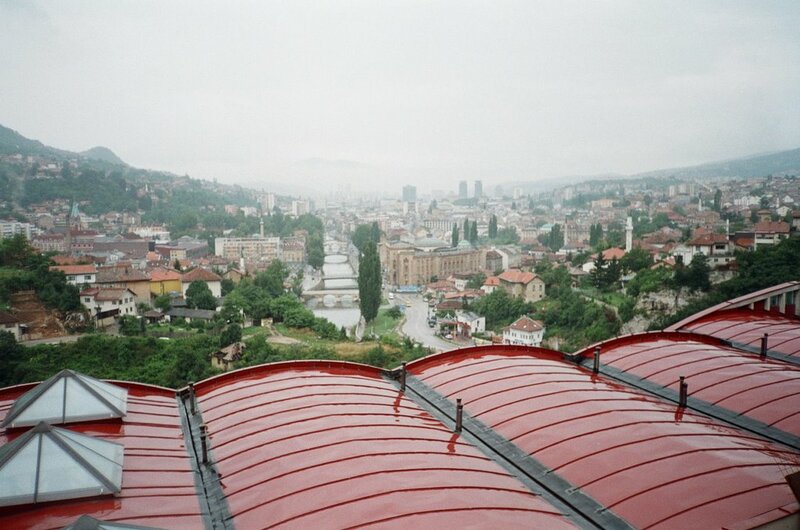 Sarajevo is a curious mixture of east and west. For centuries this city has been at the confluences of two great cultures, at the western extremity of the Ottoman and the eastern extremity of the Austro-Hungarian empires. Some women choose to wear the traditional Islamic head scarf and some young men sport Islamic-style beards, but their ethnic origins are most definitely white European and the majority of Sarajevans prefer the western dress style. The city’s focal point is the Bašcaršija bazaar, a Middle-Eastern style market place where there’s a casbah style café in which you can smoke hookah pipes and drink the notoriously thick black Turkish coffee which is standard fare in this part of the Balkans. Ask for a coffee in Sarajevo and you get a tiny cup containing a thick tar-like brew – what’s generally known as a Turkish coffee, ie black coffee with much of the water boiled off to strengthen it. Elsewhere in the former Yugoslavia you will be given a standard espresso as is the norm in most of continental Europe. Ubiquitous in Bosnia and Herzogovina is the Greco-Turkish style kebab of miced lamb in pitta bread. 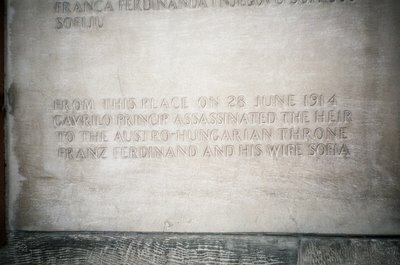 Quite by chance we stumble upon a plaque which commemorates a historic event. The bridge where the Archduke Ferdinand, Emperor of Austro-Hungary was assassinated in 1914, the catalyst for the Great War which would rage for another 4 years and result in countless more deaths. That night the beer flows. We’re sitting outside the trendy Bar Havana in the old market place. Despite the rain, it’s a lively, atmospheric spot. A talented chanteuse belts out cover versions of Tina Turner, The Police and Van Morrison songs. exhibit come work of modern art sprayed with graffiti. We’re along one of the city’s main thoroughfares, a long wide road leading to the railway station where our adventure began. Just across this road is the distinctive yellow tower block of the Holiday Inn, where journalists from around the world lodged during the war. The city is surrounded by steep craggy wooded hills, the perfect terrain for an army wanting to put a city under siege. At the railway station there’s a battered metal sign, reminding all and sundry that this city was the venue for the 1984 Winter Olympics – the mascot of a cartoon wolf and the Olympic rings against a blue background liberally dotted with rust and what appears to be the odd bullet hole. Our lodgings are in a private house owned by an entrepreneurial local who rents us a room for the sum of €10 a night. We’re on a top of a steep hill which has panoramic views of the city. Further down the hill is the “Hotel Sarayevo”, probably more luxurious than our lodgings, but considerably more expensive and no doubt with a less spectacular view. 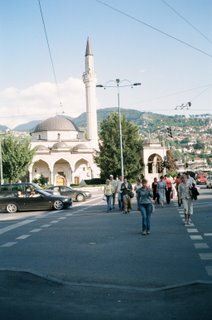 The Sarajevo skyline is dominated by apartment blocks and the tall slender white minarets of mosques. As the evening sun casts long shadows over the streets, some old men are playing chess with giant pieces. It seems so peaceful here now. Swallows swoop low over the shallow narrow Miljacka river. It has the air of a sleepy provincial town rather than a capital city. I could easily spend the rest of the summer here.